"We... got ourselves cleverly settled for the night..."
"Tents being the most expensive & essential article of camp equipage, I extracted from the returns then in my hands the numbers on w[hi]ch. we might rely on for the ensuing campaign." Perhaps the most enjoyable aspect of studying the armies of the "American War" (1775-1783) is to gain a fresh appreciation of soldiers' experiences. When new information contributes to demythologizing the conflict and the lives of those who fought, so much the better. Well-known misconceptions such as the inflexibility of British tactics, and selfless, patriotic yeomen forming the backbone of the Continental Army, mask the accomplishments of its participants and war's true nature. A study of soldiers' shelter follows in this train, bringing into focus the hardships suffered by both combatants and noncombatants, and practices common to both sides. During the war American, British, and German troops used different types of lodging to cover themselves while campaigning. Tents were preferred, with large numbers and several varieties being used, but temporary structures were frequently built when need arose. Tent shortages, loss of supplies, or lack of transportation often made makeshift shelters necessary. At other times their use was prompted by a decision to divest the troops of unnecessary baggage in order to disencumber their movements. Ad hoc coverings were also resorted to in fixed posts or winter cantonments when barracks were not available, or soldiers' log huts had not been completed. Makeshift shelters were of differing construction and varied nomenclature, "wigwams," "brush huts," "booths" and "bowers" being but a few of the names. Tentage in the armies, transport, the forerunners and descendants of ad hoc shelters, the circumstances and frequency of shelter use and their design, will all be explored in this study. FIG 1. 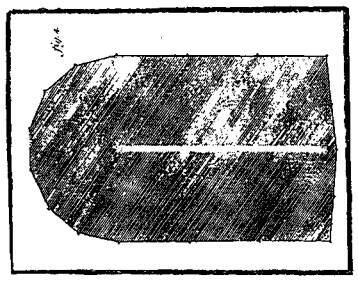 "The plan of a tent for private men" (common tent). Lewis Lochee, An Essay on Castrametation (London, 1778), 1-2, 20. Illustration by Ross Hamel. On 24 June 1782 the 2nd Rhode Island's light company was "ordered from the Regiment to go on the Lines"; five days later Lieutenant Greenman was ordered to join the company to replace a sick officer.3 The twelve days he served with the detachment give an idea of the light infantry's living conditions during this period of the war. M 1. [July. On this day Greenman was] order'd to take a party of Men and go down towards the Enemies lines to get what inteligence lay in my Power... proceeded on to Tarry Town Meating House where arrived at 12 oClock at Night... and lay on our arms. W 3. ...came to Pines Bridge where join'd my Company and continued 'till Evening, when ... took post on a hill in froont of the Bridge ... on a hill in a thicket of woods. S 6... .marched to the Bridge ... made a halt, (on account of a sivear squall of wrain)... marched toward the White Plains ... hear put our Men into barns and made a halt on account of the rain. T 11... .Major Darby... came with a Detachment to releive us. after being releived proceeded on our march towards Camp as far as Crumb Pond where halted & lay in an Orchard. Campaign living conditions in North America were rigorous and often primitive. Terrain and weather varied greatly in areas where military operations occurred and rudimentary road systems made transport of army supplies difficult at best. From the hills and coastal plains of New Jersey to the wilderness of northern New York and Canada, through the cultivated fields and woodlands of Pennsylvania and the Carolina forests and swamps the armies fought, marched, and camped. Over crude byways, farmers paths, and dirt roads the troops moved with their baggage trains, carrying, in the best of times, much of what they needed. FIG 3. Tents "for the cavalry are of the same form [as common tents], but are more spacious, especially behind, to contain the fire arms, accoutrements, saddles, bridles, &c." British “cavalry” tents differed greatly from horseman’s tents used in the War for Independence. View of a “cavalry” tent from above. Lewis Lochee, An Essay on Castrametation (London, 1778), 2-3. The American narratives above make rare mention of tents and none of makeshift shelters, though both were used frequently during the war. Many questions remain. Under what conditions were tents used? What types of tents were supplied, and of what size? How often were makeshift shelters used by Continental troops and American militia; by British troops and their allies? What were the circumstances under which such shelters were built and why were they used in one instance while in another similar situation the troops bedded down in the open for the night. These and other factors concerning soldiers' lodging on campaign will be examined in this series. FIG 4. 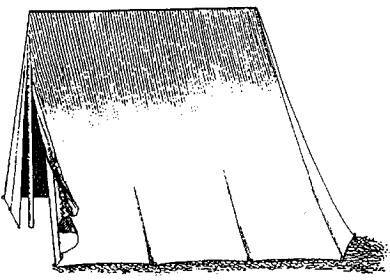 Drawing and dimensions of a horseman's tent, 7 1/2 feet high by 9 feet wide with a 3-foot wall. "Construction of Tents Dimensions & [height?] Jany. 1. 1781," Miscellaneous Numbered Records (The Manuscript File) in the War Department Collection of Revolutionary War Records 1775-1790s, no. 31492 (National Archives Microfilm Publication M859, reel 111), U.S. War Department Collection of Revolutionary War Records, Record Group 93, National Archives. 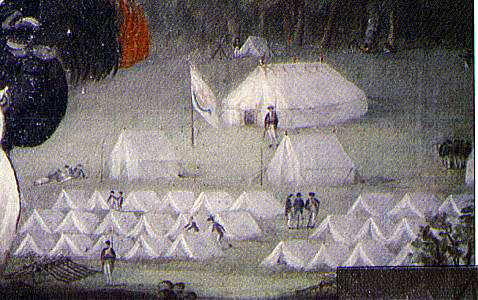 "State of Marquees and Tents delivered to the Army..."
FIG 5. A detail from Charles Willson Peale's portrait of Colonel Walter Stewart (2nd Pennsylvania Regiment), shows a marquee with ridge decorations, two wall tents, and lines of common tents. 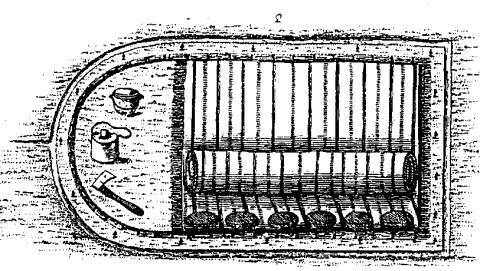 Muskets are laid on a rack in the left foreground while the guard posts feature stacked muskets. The camp is austere, with no excess baggage (chairs, benches, trunks, etc.) visible. Peale probably first sketched this camp in spring 1781 when the Pennsylvania regiments were stationed in Lancaster, Pa. (Peale’s bill for the camp sketch was dated 23 May 1781). Edward W. Richardson, Standards and Colors of the American Revolution (Philadelphia: University of Pennsylvania Press, 1982), 218-219. British French German Fold & Pack. The dimensions of the Captains and Subalterns tents, are as follows. FIG 6. 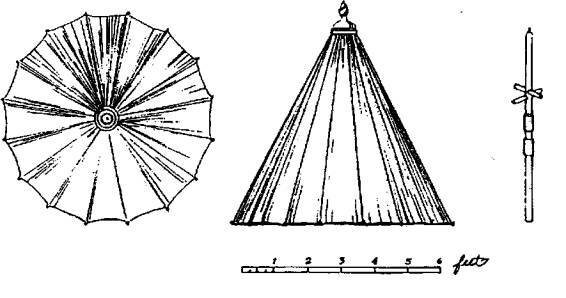 Top and side views of a bell tent used "to shelter the fire arms of the infantry from rain." On the right is the supporting pole or "standard." Lewis Lochee, An Essay on Castrametation (London, 1778), 5; Harold L. Peterson, The Book of the Continental Soldier (Harrisburg: Stackpole, 1968), 155. Illustration by Ross Hamel. FIG 7. "Doome [dome] Tent," an unusual tent which probably saw little, if any, service. "Construction of Tents Dimensions & [height?] Jany. 1. 1781," Miscellaneous Numbered Records (The Manuscript File) in the War Department Collection of Revolutionary War Records 1775-1790s, no. 31492 (National Archives Microfilm Publication M859, reel 111), U.S. War Department Collection of Revolutionary War Records, Record Group 93, NA. We have seen that canvas covering for the troops, from simple common tents to ornate officers' marquees, formed an important part of an army's military equipage. As with dimensions and design, the distribution of tents within a military force could vary from country to country. Further, supply of camp equipage was affected by the economy, the competence (or ineptitude) of the quartermaster's department and contractors, proximity to the enemy, and general military situation, and soldiers suffered or benefited accordingly. Tent apportionment, supply, and transportation will be examined in the next chapter of this series. 1. Pickering to Washington, 8 February 1782, vol. 83, 72-73, Numbered Record Books Concerning Military Operations and Service, Pay and Settlement Accounts, and Supplies in the War Department Collection of Revolutionary War Records (National Archives Microfilm Publication M853, reel 26), Record Group 93, National Archives, Washington (hereafter cited as Numbered Record Books, NA). 2. Robert C. Bray and Paul E. Bushnell, eds., Diary of a Common Soldier in the American Revolution: An Annotated Edition of the Military Journal of Jeremiah Greenman, (DeKalb: Northern Illinois University Press, 1978), 250-251 (hereafter cited as Bray and Bushnell, Diary of a Common Soldier). 6. “Saterday 15 [July 1780] we Came to the River Opersit to West point / got their at Noon [ / we Lay in the open world / Sunday 16 [July] we Crosd the River to the Point / Dra[we]d Prov[isions] and went into Tents,” 15 July 1780 journal entry, near West Point, New York, Journal of Nahum Parker for six months service, 15th Massachusetts Regiment, 1780, Revolutionary War Pension and Bounty—Land—Warrant Application Files, (National Archives Microfilm Publication M804, reel 1874), Records of the Veterans Administration, Record Group 15, NA (hereafter cited as Pension Files, NA). 7. Journal of Lieutenant Samuel Shute, 2nd New Jersey Regiment, 23 July 1779, Journals of the Military Expedition of Major General John Sullivan Against the Six Nations of Indians in 1779 (Glendale, NY: Benchmark Publishing, 1970), 268-269 (hereafter cited as Journals of the Military Expedition of Major General John Sullivan). 8. Enoch Anderson, Personal Recollections of Captain Enoch Anderson, an Officer of the Delaware Regiments in the Revolutionary War (New York: Arno Press, 1971), 39. 9. 28 September 1777 entry, John Chilton's Diary (captain, 3rd Virginia Regiment), Keith Family Papers, 1710-1916, Virginia Historical Society (hereafter cited as John Chilton's Diary, VHS). Bernard C. Steiner, The Life and Correspondence of James McHenry (Cleveland, 1907), 23-24; Joseph Plumb Martin, Private Yankee Doodle: A Narrative of Some of the Adventures, Dangers and Sufferings of a Revolutionary Soldier (Boston & Toronto: Little, Brown, 1962), 217-218 (hereafter cited as Martin, Private Yankee Doodle). For Martin's other descriptions of sleeping without shelter see pages 47-48, 74-75, and 217-218 of his memoir. 10. "Diary of Lieutenant James McMichael, of the Pennsylvania Line, 1776-1778," Pennsylvania Magazine of History and Biography, 16, no. 2 (1892): 137-139 (hereafter cited as "Diary of Lieutenant James McMichael ... 1776-1778," PMHB). 11.William M. Dwyer, The Day is Ours! (New York: Viking, 1983), 207 (hereafter cited as Dwyer, The Day is Ours!). Original source: The Revolutionary Services of John Greenwood of Boston and New York, 1775-1783 (New York, 1922). 12. "Diary of Lieutenant James McMichael ... 1776-1778," PMHB, 140; Wiley Sword, Embrace an Angry Wind—The Confederacy's Last Hurrah: Spring Hill, Franklin, and Nashville (New York: Harper Collins, 1992), 62. 13. Dwyer, The Day is Ours!, 367-368. 14. Martin, Private Yankee Doodle, 55. 15. Journal of Sergeant Andrew Kettell of Massachusetts, May 1780-March 1781, Pension Files, NA, reel 1477. 16. Ernst Kipping and Samuel Stelle Smith, At General Howe's Side, 1776-1778 (Monmouth Beach, NJ: Philip Freneau Press, 1974), 46; Scottish Record Office, Edinburgh, Cunninghame of Thorntoun Papers (GD 21); Papers of Lt., later Capt, John Peebles of the 42d. Foot. 1776-1782, incl. 13 notebooks comprising his was journal; Book no. 6, 1778 Monmouth Campaign; Samuel Graham, "An English Officer's Account of his Services in America—1779-1781. Memoirs of Lt.-General Samuel Graham," Historical Magazine, 9 (1865): 269. 17. Pickering to Washington, 8 February 1782, Numbered Record Books, NA, vol. 83, 72-73, reel 26. 18. Lewis Lochee, An Essay on Castrametation (London, 1778), 1-2, 20, 38 (hereafter cited as Lochee, Essay on Castrametation). 19. Memorandum on additions to the new manual of instruction (de Steuben's Regulations), 10 March 1779, George Washington Papers, Presidential Papers Microfilm, (Washington: 1961), series 4, reel 56 (hereafter cited as GW Papers); Timothy Pickering, memorandum to Col. Humphreys, August 1781, ibid., series 4, reel 80; Timothy Pickering to Jabez Hatch, 12 July 1781, Numbered Record Books, NA, vol. 127, reel 26, 134-136. 20. General orders, 27 May 1779, John C. Fitzpatrick, ed., The Writings of George Washington from the Original Manuscript Sources 1745-1799, vol. 15 (Washington: GPO, 1936), 162-163 (hereafter cited as Fitzpatrick, WGW). 21. "Construction of Tents Dimensions & [height?] Jany. 1.1781," Miscellaneous Numbered Records (The Manuscript File) in the War Department Collection of Revolutionary War Records 1775-1790s, no. 31492, 1971, (National Archives Microfilm Publication M859, reel 111), U.S. War Department Collection of Revolutionary War Records, Record Group 93, NA (hereafter cited as "Construction of Tents ... Jany. 1. 1781," Misc. Numbered Records, NA); Pickering to Hatch (two letters, same date), 12 July 1781, Numbered Record Books, NA, vol. 127, reel 26, 134-136, 252-253. 22. Peter Force, American Archives, series 5, vol. 3 (Washington, 1853), 452; "An Acct. of Duck deliver'd the Tent Makers & of Tents received therefor... of Mr. Bradford to June 19, 1781," Misc. Numbered Records, NA, no. 22836, reel 79 (hereafter cited as "An Acct. of Duck deliver'd the Tent Makers & of Tents ... to June 19. 1781," Misc. Numbered Records, NA). 23. Pickering to Hatch, 12 July 1781, Numbered Record Books, NA, vol. 127, reel 26, 134-136; "Construction of Tents ... Jany. 1. 1781," Misc. Numbered Records, NA, ,reel 111, item no. 31492. "An Acct. of Duck deliver'd the Tent Makers & of Tents ... to June 19, 1781," reel 79, no. 22836. 24. Lochee, An Essay on Castrametation, 1-2, 20, 38. 25. Pickering to Hatch, 12 July 1781, Numbered Record Books, NA, vol. 127, reel 26, 134-136; "An Acct. of Duck deliver'd the Tent Makers & of Tents... to June 19, 1781," Misc. Numbered Records, NA, reel 79, no. 22836. 26. Humphrey Bland, Treatise of Military Discipline (London, 1762), 289. 27. Ibid., 289; Mark E. Lender and James Kirby Martin, eds., Citizen Soldier: The Revolutionary War Journal of Joseph Bloomfield (Newark: New Jersey Historical Society, 1982), 64 (hereafter cited as Lender and Martin, Citizen Soldier). 28. "Construction of Tents ...Jany. 1,1781," Misc. Numbered Records, NA, reel 111, item no. 31492; "An Acct. of Duck deliver' d the Tent Makers & of Tents ... to June 19. 1781," ibid., reel 79, no. 22836. 29. Thomas Mifflin to Washington, 27 May 1777, GW Papers, series 4, reel 41; Timothy Pickering to Aaron Forman, 16 June 1781, Numbered Record Books, NA, vol. 127, reel 26, 83-85; Timothy Pickering to Peter Anspach, 26 June 1782, Misc. Numbered Records, NA, reel 87, no. 25345. 30. "State of Marquees and Tents delivered to the Army for the Campaign [of] 1782" (enclosed in Timothy Pickering to Washington, 10 February 1783), GW Papers, series 4, reel 90. 31. Lochee, Essay on Castrametation, 5; Walter Stewart, Inspection Report, Continental Army, June 1782, no. LWS 155, Lloyd W. Smith Collection, Morristown National Historical Park Library, (hereafter cited as Stewart Inspection Report, June 1782, Smith Collection, Morristown NHP); Mary R.M. Goodwin, "Clothing and Accoutrements of the Officers and Soldiers of the Virginia Forces 1775-1780 From the Records of the Public Store at Williamsburg," ms. copy, June 1962, 4-5, Yorktown Victory Center, Yorktown, VA (hereafter cited as Goodwin, Clothing and Accoutrements of the Virginia Forces, 1775—1780). 2nd Georgia Order Book, William Harden, ed. "Order Book of Samuel Elbert, Colonel and Brigadier General in the Continental Army, Oct 1776 to November 1778." Collections of the Georgia Historical Society, v. 5, pt. 2 (1902), 5-191 (courtesy of John K. Robertson). 32. John Conway to William Maxwell, 12 June 1778, Israel Shreve Papers, Buxton Collection, Prescott Memorial Library, Louisiana Tech University. Regimental orders, 15 November 1778, Orderly Book of the First Pennsylvania Regiment, 26 July 1778-6 December 1778, John Blair Linn and William H. Egle, Pennsylvania in the War of the Revolution, Battalions and Line 1775-1783, vol. 2 (Harrisburg, 1880), 383; Richard [Platt?] to Mr. Forman, 26 May 1781, Numbered Record Books, NA, vol. 127, reel 26, 41. 34. "Construction of Tents ...Jany. 1, 1781," Misc.Numbered Records, NA, reel 111, no. 31492. 35. "Estimate of Articles Necessary for 6000 Men for 12 Months March 2d. 1779," The Papers of the Continental Congress 1774-1789, (National Archives Microfilm Publication M247, reel 192, 61, 1958), NA (hereafter cited as PCC, NA); "Estimate of Tents and Knapsacks for the Main Army 1781," Numbered Record Books, NA, reel 29, target 4. "Estimate of Camp Equipage to be provided by Massachusetts," 1781, ibid., vol. 103, reel 29, 4-5, 6. 36. "Estimate for a hospital tent...," 23 July 1782, ibid., vol. 103, reel 29, 122. 37. Timothy Pickering to Benjamin Lincoln, 24 July 1782, ibid., vol. 103, reel 29, 124. 38. "Construction of Tents ... Jany. 1. 1781," Misc. Numbered Records, NA, reel 111, no. 31492. 39. Thomas Mifflin to Washington, 27 May 1777, GW Papers, series 4, reel 41; Timothy Pickering, "Extracts from the latest returns relative to the number of Tents &ca on hand for the campaign 1782," 8 February 1782, ibid., series 4, reel 83. 40. Timothy Pickering, "Extracts from the latest returns relative to the number of Tents &ca on hand for the campaign 1782," 8 February 1782, ibid., series 4, reel 83; Timothy Pickering to Peter Anspach, 6 April, 14 June, 26 June 1782, Misc. Numbered Records, NA, reel 87, nos. 25345, 25349, 25352. 41. "Establishment of the legion commanded by Coll. Armand Marquis de la Rouerie," 13 February 1782, Numbered Record Books, NA, reel 29, 35-37. 42. Timothy Pickering to Peter Anspach, 6 April, 14 June, 26 June 1782, Misc. Numbered Records, NA, reel 87, nos. 25345, 25349, 25352. 2 common tents, 4 camp kettles, 2 canteens, 1 axe. Brigade Major, 1 officer's tent, 1 camp kettle, 1 canteen. Brigade Quarter Master, 1 officer's tent, 1 camp kettle, 1 canteen, 1 axe. Wagon Conductor, 1 common tent, 1 camp kettle, 1 canteen, 1 axe. Forage Master, 1 common tent, 1 camp kettle, 1 canteen. Conductor of Military Stores, 1 common tent, 1 camp kettle, 1 canteen. 1 common tents, 3 camp kettles, 3 canteens, 1 axe. 3 camp kettles, 4 canteens, 1 axe. Officers of each Company, 1 officer's tent, 2 camp kettles, 3 canteens. Officers' Servants of each Regiment, 1 common tent. 4 knapsacks, 2 camp kettles, 4 canteens. Non Commissioned Officers and Privates each, 1 knapsack, 1 canteen. Each six Men, 1 common tent, 1 camp kettle. Each Artillery Company, 2 officer's tents. 44. Lochee, Essay on Castrametation, 1. 45. André Gousse, "French Soldier's Tent in 1753" (1997); handout produced for the Fort Ticonderoga War College, Parks Canada, Ottawa, 1 page. The French soldier’s tents were “made of linen canvas that was approximately 46 inches wide. There were 20 stake loops around the tent. The top of the tent was reinforced by a band of canvas that was almost 13 inches wide. There was an overlap of slightly more than 6 inches for the door flap. There were mud flaps all around the bottom of the tent.” Regulations governing tent size are from, "Ordonnance du Roi, du 17 fevrier 1753, Portant Reglement sur le Service de l'Infanterie en Campagne" published in M. de Briquet, Code Militaire, ou Compilations des Ordonnances des Rois de France Concernant les Gens de Guerre; volume 5, pp. 12-14, Paris, 1761. Illustrations showing the tent from three sides, the tent pole and the tent peg are from, M. de la Porterie, Institutions militaires; Paris, 1754; Illustration of nine men sleeping in a tent is from, M. le Maréchal de Puysegur, Art de la guerre par principes et par regles; Paris, 1748. 46. Udney Hay, D.Q.M.G., "Return of Marquees and Tents in the Q[uarte]r. M[aste]r. Genl. Department," 1 March 1780, Misc. No. Records, NA, reel 94, no. 27344. 47. "Tents in possession of James Abeel, Esqr. D.Q.Mr.G.," 6 March 1780, ibid., reel 94, no. 27344. 48. Washington to Alexander McDougall, 25 April 1777, Fitzpatrick, WGW, 7 (1932), 466. Richard [Platt?] to Mr. Forman, 26 May 1781, Numbered Record Books, NA, reel 26, vol. 127, 41.